Lately I like to take my time with these posts. To turn an idea over in my mind for a few days or even weeks. I have had an idea for a series of posts to write for some time and with the inauguration of this new site, I figured now is the time to share. When I first started farming, as a bright-eyed apprentice, my friend and mentor Mike Kane tried to enlighten me on some of the more subtle points of agriculture and one of these points was the importance of community. This is a subject I've thought over in great depth over the last few years and for the next three posts, I'll write some different takes on it, starting today with an ode to my loving community at Fresh City Farms. I use the word "ode" intentionally. An ode is a form of lyric poetry expressing emotions to someone or something. My time over the last 4 years at Fresh City has run the gamut of emotions--joy, sorrow, hilarity, worry, fury, and no small share of wonder and love. For the past 3 years, I piloted SGG at Fresh City and from the community there, felt like I had a warm and supporting hand. For a very minimal cost, I was given land, access to water and greenhouse space, the chance to purchase in bulk, use their machinery and tools, and most importantly, I had a group of like-minded individuals all trying to be better growers together. I did not have boundless enthusiasm and hope for my farming experiment. Actually, I came with a great deal of skepticism, self-doubt, crushing anxiety and full-out fear that I was going to crash and burn in an epic failure. For real. It was my fellow farmers, intentionally and subconsciously, that helped fashion me into a more skilled, savvy, passionate and confident farmer. The farmers at Fresh City are a funny lot of people. We've had the usual suspects--"tree-huggers", vegetarians, a head of dreads or two, activists and artist types. But we also have engineers, former investment bankers, biologists, and real-estate agents. We come from different backgrounds. We come with different goals. But we are united in a very genuine love for the land, the plants we grow and the work we do every day. One thing that I think is special to note is how the farm has supported so many women farmers through the years. The farm is a safe, nurturing, and supportive space. The farm has seen many faces passing through. Although it gets a little nutty, I always loved how we welcomed volunteers, people brought friends, and some of our farmers even ran farmer education programs there. Its quite the cast of characters and you get the full spectrum of stories. One thing I wanted to point out though is that Fresh City has also supported the incubation of several new farmer businesses beyond my own. I can think of at least 10 or more people in my time that have gone on to run their own farm businesses or get work as an agricultural professional. At the farm there was always room for multiple dreams and visions--from the urban homesteader to the serious business person. From my time at the farm, I can say something now that I never thought I'd be brave or sure enough about to declare: I am a farmer. I grow flowers, breath-stealing, beautiful flowers. I have no plan b--this is exactly who I want to be right now and what I want to do. I can also say in confidence that without the loving support, the frustrating challenges, the camaraderie, constant chaos, and continual good sense of humor of all my dearest fellow farmers and that sacred small space in a big park in a big city I would not be a farmer today. Things are tenuous, always, at urban farms. Uncertainty of the future has been the constant backdrop of my experience at the farm. Leases are short, costs are high, regulations nebulous, and promises tenuous. With 50% of the farming population over 55 and not enough new farmers coming up through the ranks to replace them (Food Secure Canada estimates 75% of these farmers over 55 don't have replacements upon retirement), I just don't want to see urban farms to flourish, we absolutely need them too. And please don't get me started about food security. Just ask any Canadian what they've paid lately for a head of cauliflower--if they had the money to even purchase it. We need more farmers on the land and let's face it, a lot of our young farmers are coming out of the most urbanized areas. And as I've written, new farmers need community to support them. If new farmers from urban areas are transitioning to their new careers, urban farms are a clear and definite answer. Fresh City Farms gave me the opportunity, but more importantly, it gave me a built in community. This post is not filled with staged or perfectly edited photos. It is part protest and part ode. It is for my precious farming circle. It is a letter of thanksgiving and praise for those people and that place. Grow on my friends, grow on. I have been thinking about this post for the last few weeks, turning it over in my head, trying to think about what images to include. It was supposed to be a heartfelt homage to the folks I farm with and generally up-beat. However, can't have the good without some misfortune. 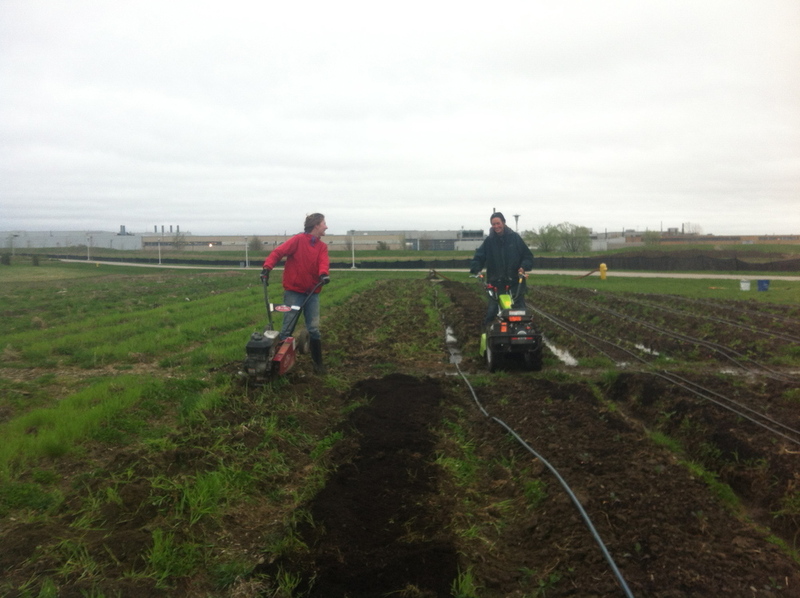 I wanted to write about how I found fantastic community in the urban farming scene in Toronto. How inspired I was recently at a community meeting with some hard working urban ag leaders. How one of my fellow farmers helped me fix an irrigation problem the other week and afterwards gave me his adjustable wrench and I literally burst into tears after receiving such kind and generous assistance. But its hard this morning for me to stir up the warm and fuzzies after the news this weekend. I'm hoping writing and sharing will help. Saturday morning I noticed 3 flats of seedlings missing. I'm a bit harried this time of year and so are so many around me, I figured it was a mistake but I was worried. The seedlings weren't mine. I was plant-sitting and ultimately they were supposed to go to community gardens in the city. Then I realized the bikes were missing. And this morning: a phone call from my friend saying someone cut a hole in the side of the greenhouse, stole all the wheelbarrows, a bunch of harvest knives, the weedwacker, and so many random things we figure its a bunch of kids up to no good. I'm relieved the didn't steal more expensive equipment or trash the place. But I have to admit, my spirits are really low. Downsview Park is a strange, strange park. Federally owned, run by multiple corporations that the bureaucracy will make your head spin, and then a bunch a renters, like me, and on the ground staff. The surrounding area has its rough neighborhoods. I don't feel particularly safe on my own there in the evening. However, I thought things were going better with our neighbors. Less theft, more people stopping by to talk and ask questions, and we're hoping to run farm gate sales this year. But stuff like this gets me seriously down and makes me wonder what we should be doing better or can we do anything better to create better relationships and community. At the farm, amongst our member farmers, we have really been trying to foster interdependence, independence, good communication, fairness, understanding and trust. We've also been trying harder to improve the ecological community at the farm: planting for pollinators, improving our treatment of the soil, etc. But I wonder in focusing so much these last few years on our own small community, we've shied the greater one around us. Because frankly, its a much more complex and difficult one to engage with. Urban farms and urban farmers are often transient. Available land in cities is only waiting for a new purchaser. Our farmers move according to job opportunities or adventures. I myself will be seeking larger fields at the end of this year. I think that's why I am so deeply sad. I know I shouldn't but I take this theft personal. Not that I'm angry at the people who stole, but angry at myself that in my time at the farm, I didn't engage more boldly with the surrounding community. I have some ideas, small ones that I will try to get moving in my short tenure left. I know its not all on me, but I should do my part. Reorient, reorganize, and try to make of the best of my time left. Update: Over the course of the 2015, there were over 4 break-ins at the greenhouse. Work continues to discourage these acts and to foster community and communication in and around the park.